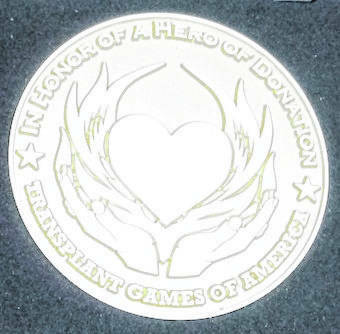 The medallion that Mary McKinney earned at the Transplant Games of America in Salt Lake City this summer. She won a silver medal in badminton. Mary McKinney, center, is joined by Lois Weaston, deputy registrar at the Mount Gilead Bureau of Motor Vehicles in Mount Gilead, left, and Lauren Stevens of Lifeline of Ohio. They are displaying the Donate Life flag to encourage residents to become registered organ and tissue donors. To celebrate this important partnership, Lifeline of Ohio is pleased to raise the Donate Life flag with the Morrow County BMV as part of DMV Appreciation Week, Stevens said. MOUNT GILEAD — Mary McKinney has come a long way — from kidney dialysis to silver medalist — in a short time. The Cardington woman competed in badminton about 18 months after receiving a kidney transplant. She had waited three years and one day to receive her new organ Jan. 28, 2017. McKinney was diagnosed with glomerulonephritis around 1997 and knew she’d need a transplant eventually. 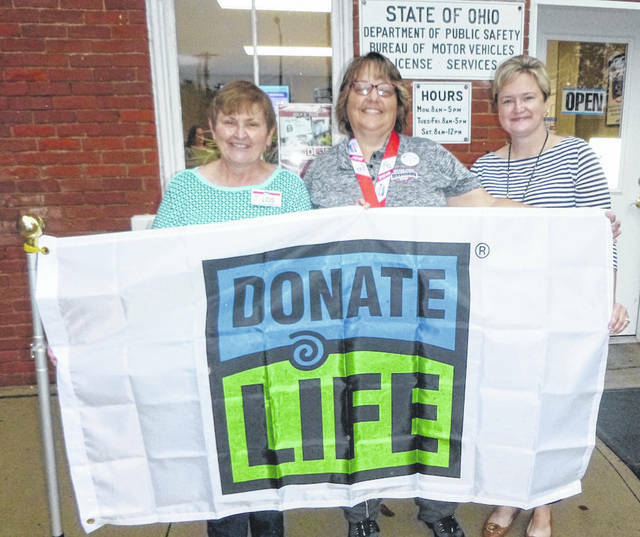 On Tuesday, Sept. 25, she was honored with a Donate Life flag at the local Bureau of Motor Vehicles office to encourage residents to become registered organ and tissue donors. More than 5,000 recipients from the U.S., Canada and Australia competed Aug. 5-7 in the Transplant Games of America in Salt Lake City, Utah. “Everybody was so wonderful; it was amazing,” McKinney said. “I competed with a girl. She was absolutely amazing. She won. She was kind of a pro,” she said. About 22 people die per day in the United States waiting for a lifesaving organ and states that there are currently 122,000 people on the organ transplant waiting list. More than 100,000 of those on the list are waiting for a kidney transplant, according to Lifeline of Ohio’s Jessica Petersen. The organization, in addition to spreading organ donation information, works with 72 hospitals throughout central and southeastern Ohio and West Virginia to evaluate, manage, recover, preserve, allocate and transport organs and tissues for transplantation. “On behalf of the nearly 115,000 Americans – including the close to 3,000 Ohioans– waiting for a life-saving organ transplant, I want to thank the Morrow County BMV for joining us as we fly a Donate Life flag as part of our Flags Across Ohio campaign,” said Lauren Stevens, Community Outreach/Partnership Coordinator of Lifeline of Ohio. McKinney works for A Touch of Grace home health care. “They’ve been great to me,” McKinney said. She also had plenty of support from family and friends and those at the Cardington pool, where she took classes to improve her strength. McKinney recently picked up another hobby.